Due to this article and a few more like it, we’ve stopped using this detergent. I know. 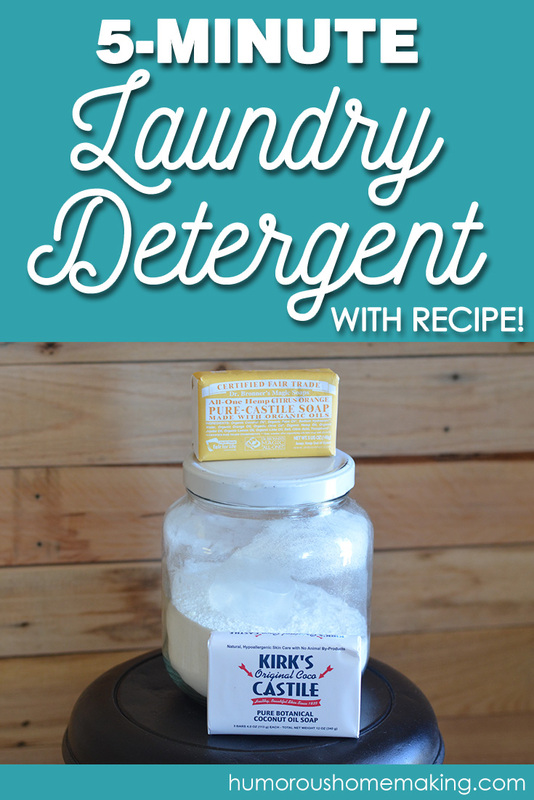 You’ve wanted to try homemade laundry detergent, but it seems too messy/time consuming/overwhelming/weird/smelly/hippie. Or maybe you tried it and you felt like it left your clothing looking dingy – like someone mopped the floor with it and then put it on to stand outside in acid rain. I too have been there. I’ve flip flopped around with laundry detergent like a sea bass on a dry dock. So, what’s a girl to do, you ask?! How do we lead a more chemical-free lifestyle and not look like someone from The Grapes of Wrath?! 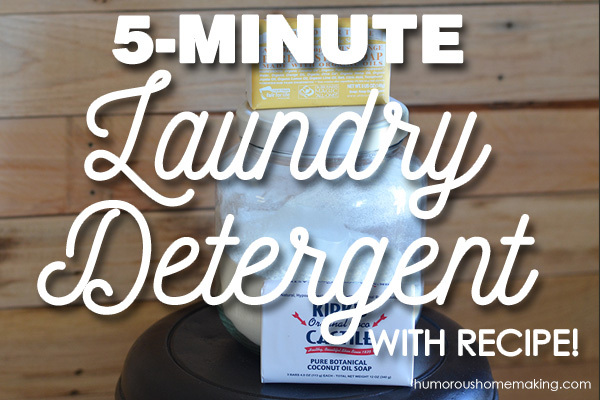 This super easy and quick laundry detergent is gonna save your behind. Because it’s fast and it WORKS. I’ve got you covered – like a pair of stark white undies. In the past, I’ve waxed eloquent about liquid laundry detergent and powder versions too – and then, I would get frustrated and switch to soap nuts or even….Tide®. Sometimes a girl just wants clean laundry without having to THINK SO HARD about it. Amiright?! So, let me tell you this: do what works. If you want to try homemade detergent for a while and then switch back to store bought. Coolio. Do what works for you in your current season. Because I have a son with extremely sensitive skin, it’s caused me to take a look at some of the chemical-based things I’ve been using – and in so doing, we’re trying to use LESS stuff with additives and scents. As for me and my house, this homemade powdered detergent is rockin’ my face off so I’m going to share it with you below in printable form – because I’m cool like that and because YOU like printables. This is riveting stuff right here. I add 2 tablespoons of this soap to the water as my tub is filling (not my bathtub, my laundry tub). If you have a HE washer, only use 1 tablespoon…or so I’ve read. Add white vinegar to the fabric softener dispenser. It’s about 1/2 cup total. Dry – in the summer I like to line dry to get the sun bleaching effect. In the winter, I’m all about the dryer, baby. I used to use various soaps like Fels Naptha or Ivory. But since moving to using essential oils, the scents in those bother me. So, I’ve started using a castile soap. I like Kirk’s Castile Soap and you can find it at Walmart in a 3 pack in the bar soap section – not the cleaning section. OR you can buy Dr. Bronner’s Castile Soap bars from Vitacost ($10 off $30 with that link). BORAX IS A POISON FROM SATAN! Well, I disagree. I’ve heard all the arguments. “It’s not safe for kids or pets!” Well, neither is chocolate cake, bleach, or permanent markers. And yet, we still use those on occasion. So, read this post from Wellness Mama on the safety of Borax to set your mind at ease. I’ve tried the “trick” of microwaving the soap bar to make it easier to work with. The first time, I couldn’t get it to work at all. The next time, I burned it to a crisp and set off the smoke detector and possibly caused all of us to get an incurable disease from the Fels Naptha fumes coming from my kitchen. Just chop it into smaller chunks and pulse it in your food processor or high powered blender. The chunks get small and then you can add the other ingredients to pulse and get a nice, fine powder. BEWARE of the large quantity of “smoke” that will come out of your blender when you take the lid off. Don’t inhale (throwback to Bill Clinton) – but freak your kids out that you’re a scientist. It’s just soap fumes – but again. Don’t breathe it in…it might make you cough and sneeze FOR DAYS. Or so I’ve read from other people. You don’t need to add the essential oils – but I feel like it gives it a nice scent and an extra boost. I like to use tea tree oil and a citrus oil combo. My favorite is tea tree oil and orange. How did I just talk forever about soap? I have no idea. But, I did. However, don’t you feel so much more ready to tackle this project now?! You can do it! Try homemade laundry detergent. If you hate it, Tide® will always take you back. Except insert Jesus in the detergent part and Satan in the Tide® part. Not that Tide® is Satan, but you catch my drift here. Right? ^^^ Click there for the printable recipe. If you like citrus scent, I have found that Zote soap has a wonderful citrus scent and I even found it in pre-made flakes! Totally awesome-sauce because there is NO GRATING OR BLENDING! If the grated/blended chunks are too large they leave oily spots…but not a prob with the flakes. Just toss with the other ingredients. My kiddo has eczema and this substitution works well for him. Thanks for the tip, Leigh! We had bad luck with homemade too! I loved it for a long time at first. It started leaving oil spots on our clothes. After we cleaned the machine and switched detergents we eliminated the problem! There are pictures of the spots on the link. Have you tried Young Living’s detergent yet? Lot of smarts in that pognsti! I have also been making this for many years! 🙂 It works great in my HE machine. As well, I recently started adding an equal amount of regular baking soda (meaning equal parts of borax, washing soda and baking soda) and have had great results. It adds a deodorizing element that we seem to need…I love adding essential oils! My current favorite combo is peppermint and rosemary. I may have to try the Fels Nafta or castile. I’ve just always used Ivory or the shredded soap flakes that you can buy at Wal-Mart. Do you know if this is safe for those of us with a septic system? Also, does this work well to remove stains, or do you use a stain remover? Due to further research, we don’t make this any more. It’s 2 4-5 oz bars. Sometimes the size varies in castile soap bars. But it’s almost always 4-5 ounces each. Is that 24 bars of castile? 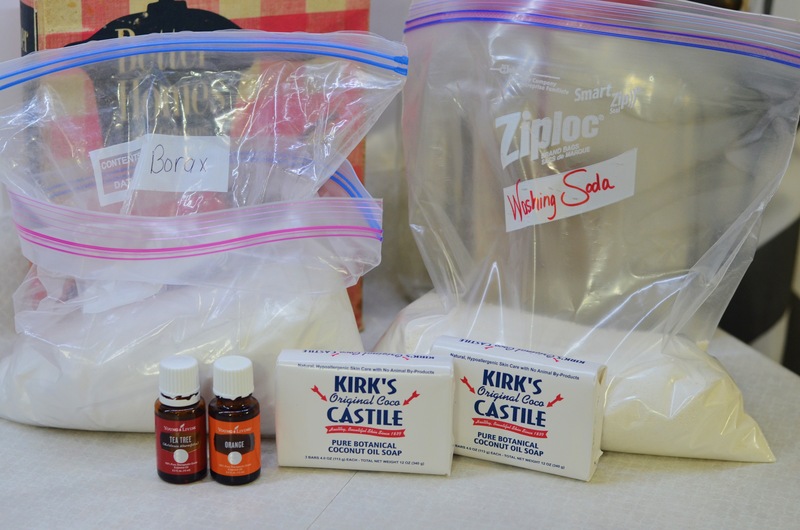 Have you tried making a liquid soap with liquid castile? I clicked on the link and read the article about liquid detergent (does not use liquid castile) and then clicked on a link for liquid detergent made with liquid castile soap, but I got a 404 error message. Help? I took that article down because while it worked for me, a lot of people said it didn’t work and honestly I was tired of all the ugly comments. Ha ha! I haven’t used liquid castile in this one. It’s worth a shot – I’m just afraid it would make it clumpy. I use a very similar recipe, just without the vinegar rinse. That’s a smart idea, though!